The 15 Point Plan is one of a large number of services provided by the Betfan stable, but we're advised that this is one of the better ones to follow. 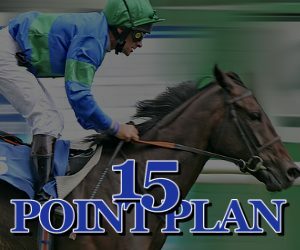 The 15 Point Plan is a daily horse racing service from Ian Winfield who has been good friends with the guys at BetFan since 2010. Ian’s strategy finds 5 top horses a day and then he rates them 1 to 5 points which equates to 15 betting points a day. More details on that right here. Since launch back in late June of 2017, The 15 Point Plan has a strike rate of some 23.52% generating profits of 632.5pts at an ROI of 17.94% at advised odds/stakes. At the time of writing this preview, a subscription to The 15 Point Plan was priced at £47.00 per month (quicklink here) , whilst better value was available in a quarterly sub at £94.00 for 3 months (via this link), but the best deal currently on offer is the six months for just £154.00 (available here), which actually equates to a 45% discount on monthly fees. This service got off to a disastrous start winning only 1 of the 30 bets in the first 6 days showing a loss of -23.4 points or -£230 to £10 stakes. Although the review runs for 60 days this was a huge mountain to climb as more immediately it had to recover enough in the first 30 days if punters would risk paying for another month. By Day 13 the losses had risen to -27.11 or -£271.10 which was reduced to -7.29pts/£72.85. This was encouraging as there was still time to make a profit in the first 30 days. Sadly this wasn't to be and not only did the first 30 days end with a loss but the first 6 days of the second 30 days were as bad as the first 6 days of the review culminating in a high of - 33.13pts/£-331.35. There was a slight recovery for the rest of the month eventually ending with a profit of 1.85pts/£18.52 which did not cover the subscriptions.